The role of social media in the construction industry has grown to a degree that’s impossible to ignore. Learn to use this marketing opportunity to your advantage so you can reach high-value clients before your competitors do. Setting specific goals helps you see when your marketing efforts are working and when you need to make adjustments. Keep your overall business goals in mind. Measure real business outcomes such as leads, referrals, and new business relationships, rather than “likes” and shares. Shares help increase awareness, but don’t always translate to new clients. While there’s no one right way to do social media in the construction industry, some companies are more successful at it than others. To avoid having to reinvent the wheel, spend some time browsing the accounts of your competitors and related businesses before you decide on your approach. Look at the types of content they share and note what seems to garner the most engagement. Pay attention to which platforms have the most responsive audiences. Rather than copy their approach, though, take what works and adapt it to your company’s own unique selling points and target clients. The types of content you’ll post for each audience. Tailor your content and posting schedule to each platform. What works on Facebook doesn’t necessarily work on Instagram. Also consider how you’ll source your content. Decide where you’ll get your images, who’ll create your videos, and which magazines, websites and other social media accounts you’ll follow for news and ideas to share with your audience. 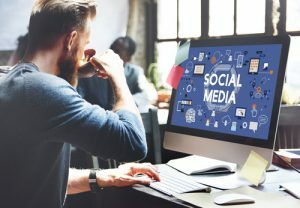 With the use of social media in the construction industry growing steadily, the better you can define your approach to these platforms the more effectively you can stay ahead of your competition.